Yesterday we celebrated a wonderful achievement…the dedication of the College’s new Advanced Manufacturing Technology Center in Oshkosh. But this wasn’t just about the College. It was a celebration of great partners working together to ensure that our region has a skilled workforce in metals manufacturing. Miller Electric Manufacturing Company is our primary partner in this initiative and, in fact, was the first organization we approached to help us make this center a reality. A welding student works on the latest Miller Electric equipment at FVTC's Advanced Manufacturing Technology Center. This all started when companies in the Oshkosh area shared concerns with us about their growing need for welders, fabricators, and assemblers and the limited pool of skilled people to fill these positions. 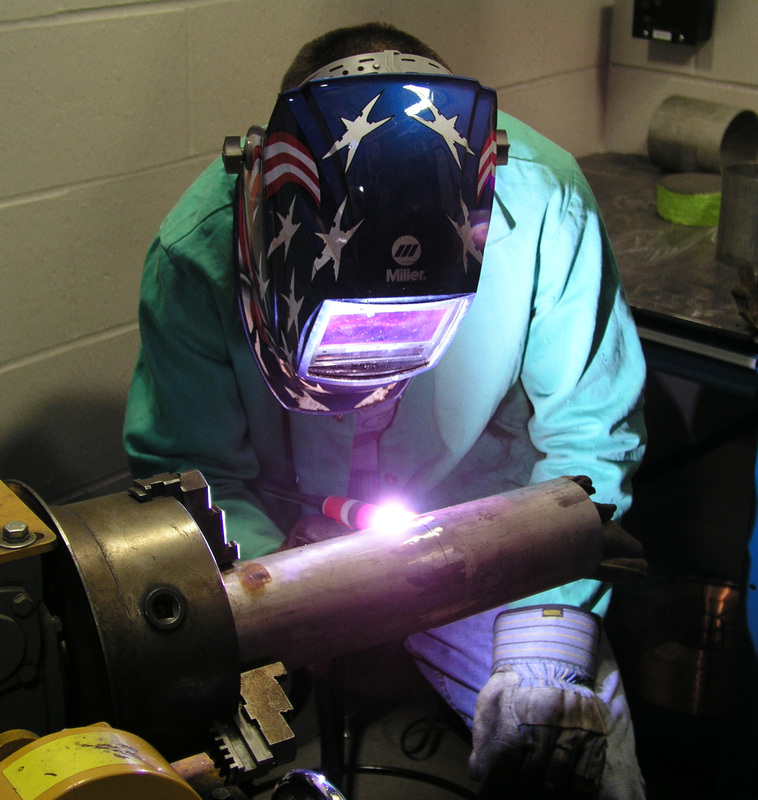 Our welding and fabrication labs at the Appleton Campus were already running at capacity and the one small lab in Oshkosh was within a few hours of running classes around the clock trying to address the demand. We needed to do something…and quickly. 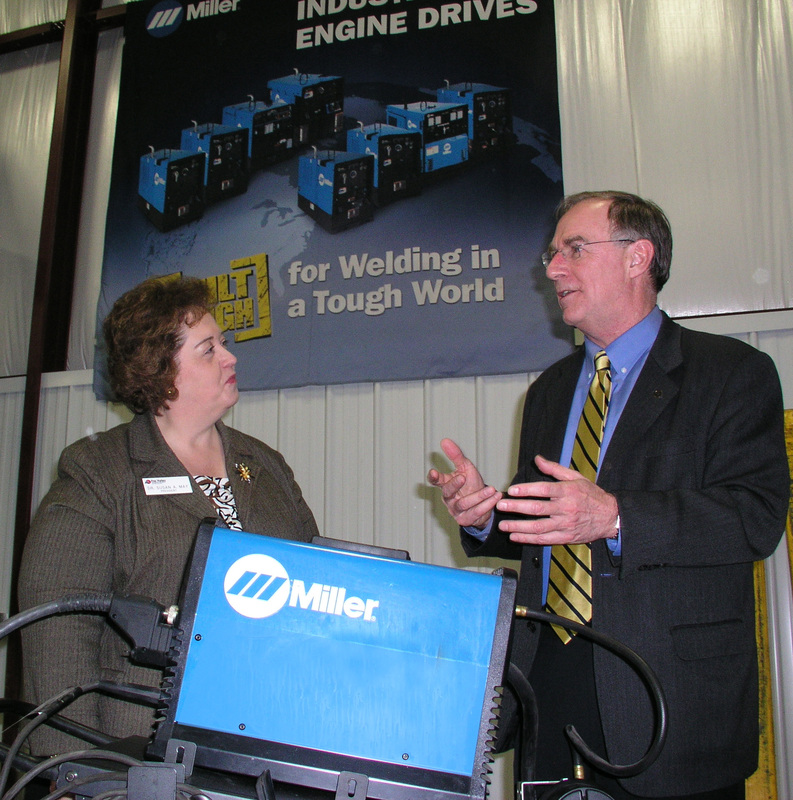 Dr. Susan May shares some thoughts with Miller Electric President, Mike Weller. We decided to lease a facility in the community for this purpose that would significantly expand our ability to address this workforce need and give hundreds of people, including those who were unemployed, the opportunity to learn and develop these skills. Miller Electric supplied over a million dollars of equipment for this center–arc welders, ventilation equipment, fabrication resources, and testing equipment. This is a showcase facility for Miller’s latest technology and they will help us to keep the equipment updated. In return, the College provides a wide range of customized training for Miller employees. Other area employers are contributing to this new center as well, with robots for welding applications and substantial materials and supplies. Everyone wins in this kind of partnership–our corporate partners, the College, our students, regional employers, and communities. And this kind of local response to an economic need is only possible when organizations such as FVTC have the flexibility to respond and proactively find reasonable solutions to problems. The proposed State Budget not only reduces state support for technical colleges by 30%, but it completely freezes our local levy authority. This reduces local control, and thereby our College’s flexibility to respond to local needs–needs such as the one I’ve described above in the Oshkosh manufacturing sector. I’m very concerned that limiting our ability to respond appropriately to employer workforce needs in our region will be less than helpful to the economic recovery, job creation, and business competitiveness. What do you think? If you share my concern and want to weigh in on the State Budget, I’d suggest you make your voice heard with our legislators. There is a simple link to use for comments on the budget. It is www.budgetcomments@legis.wisconsin.gov.